﻿Last week I got to see first hand some of the best and worst of humanity. My family and I had traveled to Central America. We stayed at a nice hotel in the best part of the city (two blocks from the U.S. Embassy), but even the best places there are prone to crime. On Thursday morning, we met a local friend at the hotel restaurant, and I let my guard down. An organized crime ring involving at least 4 men stole my purse and its contents -- including my wallet, a credit card, a couple hundred dollars in cash, my car keys and my passport. I made a mistake, and it cost me several hundred dollars. To be honest, God was taking care of us because we were in one of the most dangerous cities in the world and we only lost several hundred dollars. Armed guards are everywhere in the city. (The hotel has two. The security cameras later revealed one man had distracted a guard while another carried out the theft.) Concrete walls topped by razor wire surround many of the buildings. The ubiquitous crime and corruption have left poverty and despair in their wake. And yet, across town, a light shines in an even less prosperous part of the city. Behind a nondescript concrete wall is the orphanage we came to visit. There, Orthodox nuns oversee the care and education of abused and abandoned children. The juxtaposition between these two worlds -- or really, worldviews -- couldn't be more stark even though they were only a few miles and minutes apart. On one side, greed and corruption and crime prevail. Life is cheap and meaningless. Indeed, on our last day, four people were murdered nearby, shot on the street during the night. But inside those orphanage walls, one finds an unselfish dedication that absolutely humbles me. Reflecting on our trip, I thought back to the many times I've heard secularists decry Christianity. If there is a God, they ask, how do you account for evil in the world? I recently read a response that flipped that question on its head. If there is no God, how do you account for good in the world? Because in a godless world, in a world where "survival of the fittest" holds sway, there is no rational reason for service to the least and most vunerable. When Jesus ordered his followers to reject mankind's natural proclivity for selfishness, he led by example. He blessed children and ate with sinners rather than spend his time with the VIPs of his day. He performed the tasks of the most menial servants, such as the washing of feet. And he sacrificed his own life. Last week, I had an up-close-and-personal view of the contrast between the life spent in service to God versus a life spent in service to self. That is the difference the cross makes -- and the reason that we must share the cross if we hope to change the world. Have you had a recent encounter with someone whose service to God is an inspiration to you? Wow, CJ. Your story made my stomach clench. Thank the Lord you and your husband weren't hurt. And thank the Lord there are people like you and your husband who travel to places such as this to care for children. God bless Madre Ivonne and the other nuns caring for those precious children. I love the picture you included of her. Thank you for sharing this story. I feel incredibly blessed. I love the way you spun that question around. In a godless world, how do you explain goodness? That's a very good way to respond to that question. I'm on my way to bed, and I'll be praying for the nuns and those precious children in the orphanage. "If there is no God, how do you account for good in the world?" That is so powerful and true. Isn't it funny how we often ask the wrong questions. I've been so blessed recently by a young man, Paul, at our church who has just become the Young Life leader for my son's public school. With my son entering ninth grade this year, I've been so thankful that he's getting started on the right spiritual footing. Then last week I discovered that Paul turned down a $60,000 a year job to take this missionary type position for which has has to raise his own paltry salary. Wow! Only God could do something like that. What a powerful post, CJ. What a testimony. I loved how you turned the question about suffering around. I'm so inspired by Christians I know who are willing to go and do the Lord's will, even at great cost. I'm so glad you arrived home safely. C.J. what an amazing story. Thank God for His grace and mercy for you and your family! Excellent point, too... we are SO focused on the negative things, the failures, the losses, the evil. I may just use that upside-down question on my coworker! Suzie, we were fortunate there was no violence involved. Of course, we realized that later! And the nuns are amazing. 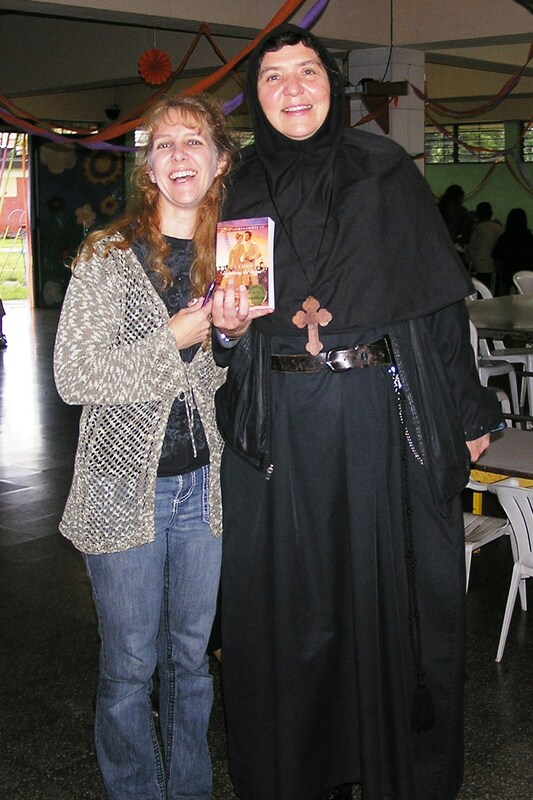 I'm laughing pretty hard in the picture because Mother Ivonne was so insistent that I not leave before I had signed a book for her. Dina, Paul sounds like the perfect person to help kids through the difficult high school years. Who knows how many lives he will impact in ways that won't be evident for years yet. Susie, it's always good to get back to the USA -- although we did get a customs agent who didn't believe we were only bringing back$20 worth of souvenirs. (That's what happens when you have to cancel the cc and you want to make certain the cash lasts the entire trip.) Almost made me wish I'd made some stuff up to declare for the customs guy. Niki, let us know how it goes with the coworker. Animals don't seem to have a concept of good/evil, so why do humans? What purpose does it serve if there is no God? I'd love to hear an explanation from someone who doesn't believe in the existence of God. Thanks for the post, CJ. I was worrying and praying and wondering. Our eldest daughter is spiritual in a worldy sense. When she was 9, she posed this question and left her dad and I speechless... "Why bother being good if you're just going to come back as an animal?" By the time we cleared that question up - or so we thought, she responded with... "Then why bother being good at all if you can just ask for forgiveness before you die?" Of course we explained that you don't know when you're going to die. She wasn't impressed seeming to believe the odds were in your favour that you'd have time. Sheesh. That's what I get for not taking her to church when she was young. Ugh. Plenty to think about from your post and the comments, CJ. I'm so glad you are back safely (of course, wishing you were bringing back an extra person!). What a blessing to see this kind of service in the middle of such a disheartening environment. Thank you for sharing your trip and story!